What's your favorite thing about summer? The warm weather? BBQ's? Family get together's? Personally, I love all of the above! I love feeling the sun on my skin, the sound of laughter and being surrounded by my family every weekend. I know for me, every weekend isn't always perfect and I am usually in a rush. Have you ever gotten a last minute call, that you were hosting the weekend get together? I get that call ALL the time. Thankfully I am always prepared and I owe it all to Chobani Mezé Dips. These dips are unlike any other dip, they are a delicious combination of real vegetables, and thick, creamy and trusted Chobani Greek Yogurt! The great thing about Chobani Mezé Dips are that it pairs with everything and can be found at your local Walmart in the in the Deli section. So from vegetables, bread, chips, and my absolute favorite baked buffalo cauliflower to pretzels and so much more. Chobani Mezé Dips are perfect and come in 4 delicious flavors, Roasted Red Pepper – a sweet and slightly hot, mix of roasted peppers, Three Pepper Salsa – a light blend of green peppers, chili peppers & jalapeno peppers with herbs, Smoked Onion Parmesan –a rich mix that combines bold onion flavor with nutty parmesan and Chili Lime – a tangy blend of lime and light spice, with ranch-style herbs. Don't have the time to make baked buffalo cauliflower? No worries. Simply add cauliflower to your tray and your guests will be screaming for more! But if you are like me, you'll always have something in the freezer prepared and ready to go for those last minute calls.. And my go to is Fruit Ice cubes! 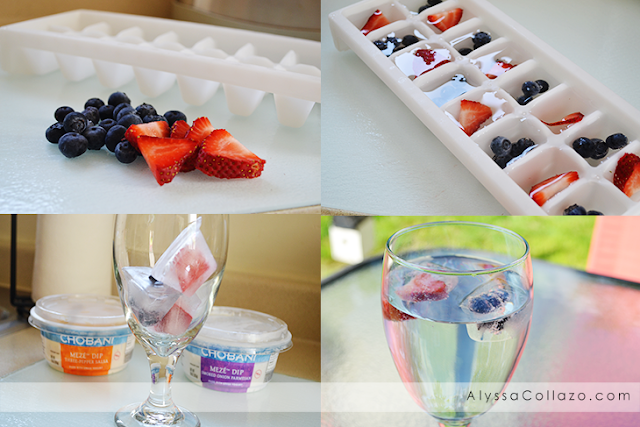 Fruit Ice Cubes are so easy to make you won't need a recipe! Take some blueberries, cut up some strawberries, add them to an ice cube tray, fill the tray with water, freeze for about 4 hours and wallah there you have it. Add your favorite beverage once the ice cubes are set and you'll be ready for anything! 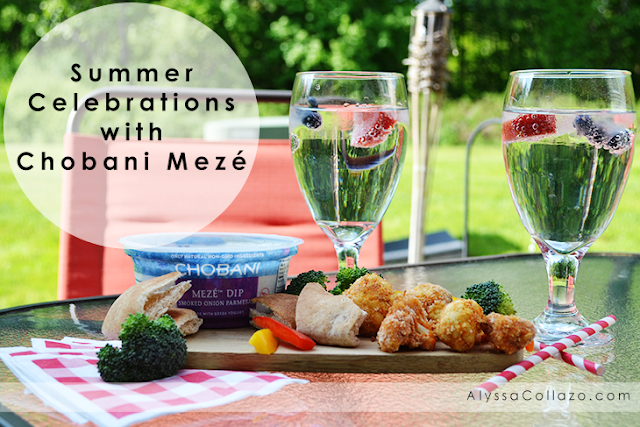 Want to know what's even better about Chobani Mezé Dips? They are made with Chobani Greek Yogurt and real vegetables, that are made with only natural and non-GMO ingredients! Plus, it only contains 1g fat and 25 calories per 2 Tbsp serving. No more serving hummus or French Onion dips! 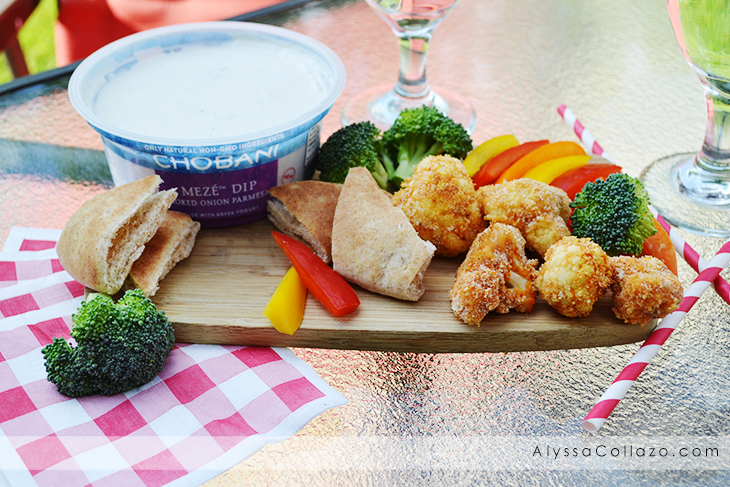 Chobani Mezé Dips are easy to serve: just open and pair with your favorite snack! Speaking of snacks, what is your favorite snack? 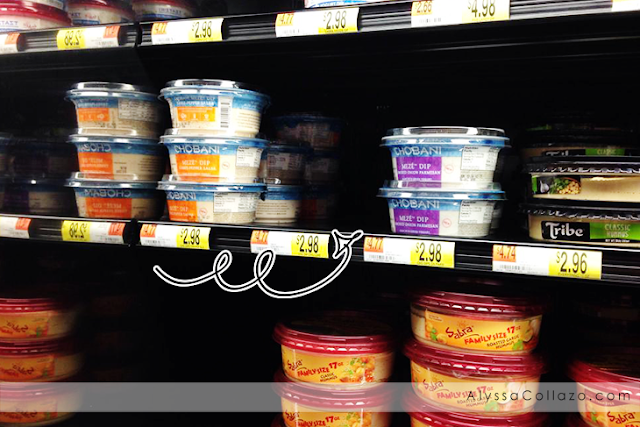 Be sure to pick up Chobani Mezé Dips at your local Walmart, in the Deli section. I just know like my guests, your guests will be extremely happy and satisfied with this Greek Yogurt Dip. And best of all, it’s a convenient solution and ready for all your Summer celebrations. These dips look amazing! I have to say... I am a huge fan of friend cauliflower and broccoli. These dips look like they would be amazing paired with them. I have to say, the fruit in the ice tray is such an awesome idea! I would have never thought! I am gonna have to try that as well!! I didn't know they had dips. I love dips, I can dip just about anything from crackers to vegetables, even cheese. I love a good dip! I have always liked Chobani brand and this sounds perfect for a summer cookout. Looks like a yummy idea for snack time, I will have to give Chobani a try! I need to find these dips! They look just delicious. I love Chobani yogurt. I love chobani yogurt so I need to check Chobani meze for my next brunch party. They look absolutely delish!!! And I love your entire set up, just gorgeous. Anything made by Chobani is great in my book. I've never seen the Chobani Meze before but I'll be keeping my eyes peeled the next time I go to the store! Those dips look so delicious, I'll pick some up this weekend. I can't wait to get creative with the dip this weekend. These look and sound delicious. I love a good summer dip when we eat outside or entertain. Which is often. These are all such adorable ideas! 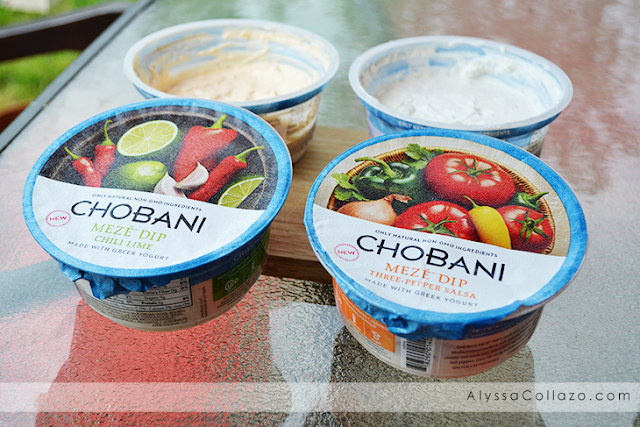 We just had a party with Chobani Meze dips! I did not know Chobani made these dips! I have not seen any of these dips in our grocery stores here. I am looking forward to trying them! Yum! I love meze , that looks like a good idea. Thanks for sharing. The idea of the fruit ice cubes for the summer drinks is indeed an awesome idea. The Chobani Meze Dips would indeed be great dips for any party. Thanks for sharing the ideas. I really hope I could find Chobani at thee local Supermarket. This sounds really good. I've seen Chobani before but didn't realize they had dips as well. Cute cubes, I just made some.